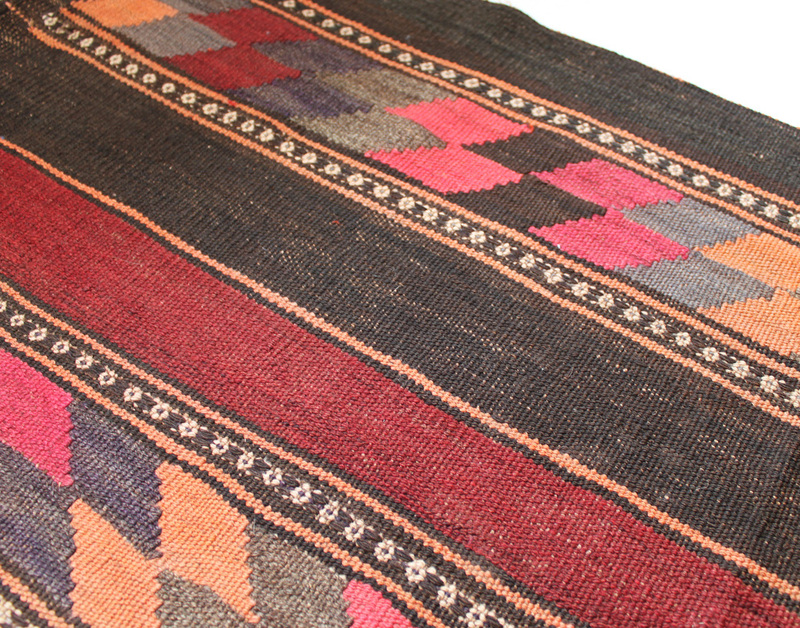 Limited edition woven vintage Afghani Hazara wool kilim. This textile is in a combination of rust, grey, black, brown, yellow and pink. Adjustable/removable leather strap, Leather handle and bottom. Snap closure & brass hardware. 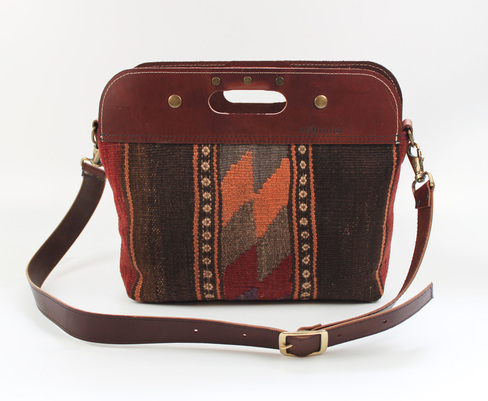 Strap length - up to 43" x 1.25"
"Afghanistan is one of the three main areas of kilim production along with Anatolia in Turkey and Iran. The majority of peoples were nomads (living in yurts) or settled farmers. Their lives have inspired a wealth of motifs and patterns. Each ethnic group has particular symbols, patterns and colour combinations. 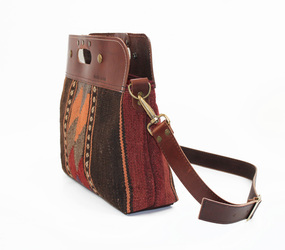 They are woven by people who collect the raw materials then spin, dye and weave the wool. Each village or family has distinctive motifs. 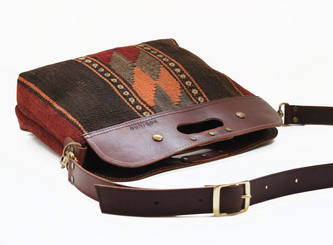 Using portable looms built from tree branches and wool from their flocks they produce a stunning range of rugs. Traditionally the weaving is the women's domain." "Girls learn on tiny toy looms. Once competent they join their mothers and grandmothers and kilims are included in their dowries. Kilims are often woven from memory, with children absorbing the patterns. The patterns have nicknames such as mousetail, arrow and comb. The symbolism in the patterns has been passed down through generations. Kilims are often a form of visual communication expressing the hopes for good fortune, fertility and protection. The troubled history of Afghanistan has brought together a great diversity of ethnic groups from the Baluchi to the Uzbek and thus a varied range of designs." Limited edition alpaca wool weave paired with leather top and strap & burnt orange wool lining. Fits your camera, wallet, cellphone, makeup, odds and ends. 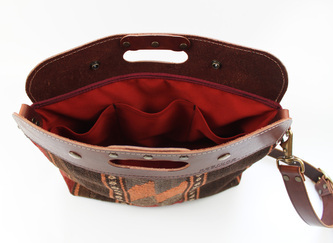 Perfect little bag for a minimal outing or inside your lager bag. 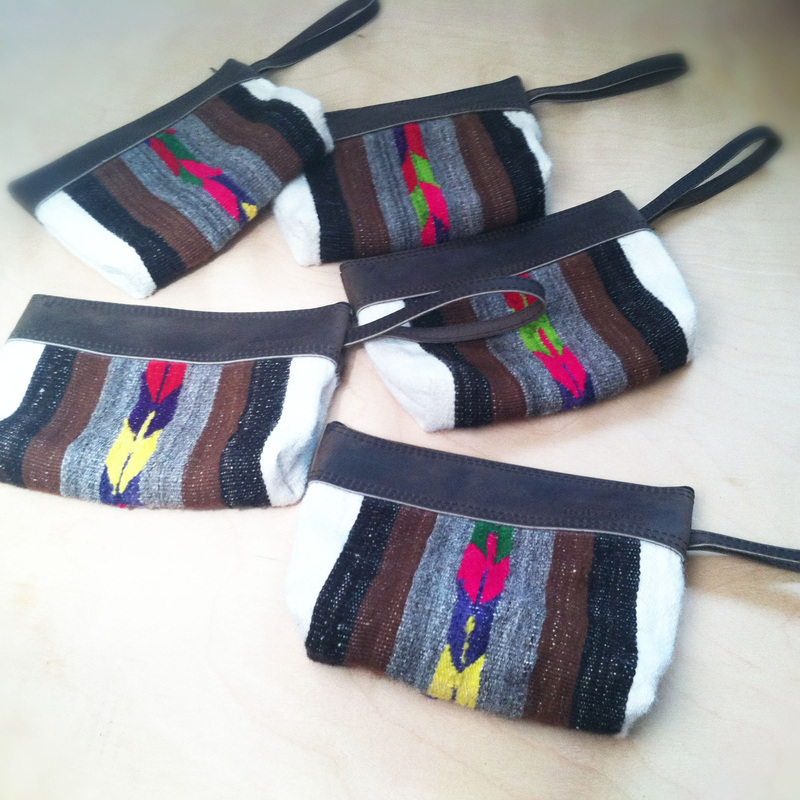 H: 7" W: 9" D: 1.75"
*note: each bag varies slightly on pattern.